What do you recall from your childhood? What memories stick in your mind? Is it playing with your friends? Is it birthdays or family vacations? For me, there is truly one thing that sticks in my mind. My mom’s Avgolemono soup. For those of you whom aren’t Greek, it is Chicken Egg Lemon soup. Ever since I was a little kid, I remember my mom making it. I don’t recall her making it for special occasions, but it was something very special to me. I was a very picky eater growing up. I am pretty sure my diet consisted of hard salami, slices of American cheese, Goldfish, and my mother’s homemade pasta sauce. In case you don’t know, that is not a balanced and healthy diet. My poor mother, try as she might, really struggled to get me to eat other things. It was by no means her fault. I do recall always liking one dish, it was her Avgolemono Soup. I could also tell me family really enjoyed it too. Whenever we were eating it there was just silence. This was quite a feat for our family, between my brothers and I, our house was never quiet. So, for there to have been utter silence, there must have been something incredible going on. It was my mom’s Avgolemono soup. It wasn’t until after being diagnosed with my first cancer that my taste for food really expanded. I would watch so many hours of the Food Network and the Travel Channel. At the time I was never quite sure why I watched these channels. All I was doing was torturing myself. Most times I couldn’t eat or drink and all I wanted to do was throw up. Yet here I was watching the Food Network and the Travel Channel. Later I would realize that it was because I wanted to escape. I wanted to see a world I had never known and might never get to know. I would lay there wanting to visit these places and try these foods. There was one show that stood out and it was Anthony Bourdain’s: No Reservations. He would travel to these incredible places that I have never even thought to go visit. He would eat food with strangers and be completely happy doing it. Whenever he would travel to countries in Asia you could usually bet that he would find an incredible tasting bowl of noodles. In Vietnam he found the Lunch Lady. This incredible woman makes these ethereal broths that attract people from all over Ho Chi Minh City. It appeared that everyone that was eating her soup was happy, as if the problems of the day had just vanished. It reminded me of being a little kid again and eating my mom’s soup. I saw on their faces what I felt when I was a little. I needed to find that feeling again. It would take me 12 years, but I would reach my goal. Two years ago, my mother and I were in Washington D.C for the Childhood Cancer Walk on the Mall. For one of our meals I insisted that we go to Momofuku, one of Dave Chengs’ restaurants. The only seats were at the bar. I started up a conversation with the bartender. I was asking him questions about everything I could at the restaurant. It wasn’t until after we were done eating and about to leave that I finally said what I had really wanted to say. I asked him why there wasn’t any Ramen on the menu. He told me that it was a special and that he had said that to me. I realized that due to my exhaustion and sadness from the day’s events that I had missed him telling me that. I was so mad at myself. I have been watching and reading about Dave Cheng since I was first diagnosed. I had dreamed of trying some, in my mind true Ramen. I immediately told my mom that we had to come back again tomorrow. Thankfully she loved the food as well, so it was not hard to convince her. The next night we sat in the exact same place, and I knew exactly what I was going to order, the Tonkotsu(pork) style Ramen. I felt like a little kid on Christmas. I was sitting on the edge of my seat the whole time I was waiting. Then, finally it came out. The most incredible looking bowl of noodles. I put my face over the still steaming bowl of noodles and just inhaled. The smell was incredible. I didn’t care how hot I was. I took up my chopsticks and went for it. The noodles and the broth were so hot, but I kept eating them. 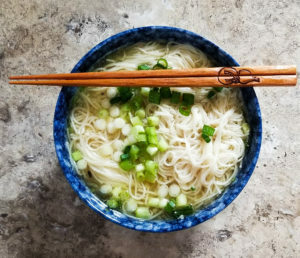 The noodles were perfectly chewy. The broth was utterly ethereal. I don’t even recall what was in the broth other then the noodles. It just tasted so good, and in that moment, I was transported back to my childhood. Here I was, sitting next to my mom, just like I was little again. That moment was truly perfect. We spent the rest of the night talking about the soup and what it tasted like and how it made us feel. One of my favorite moments of my life. When I returned home, I was determined to first make that broth but more importantly never lose that feeling I felt that night. I have been alive for just over 28 years. For most, if not all that time I have never felt like I fit in. I have always felt weird and a little bit of an outcast. It was never my friends’ fault. I could not have asked for better friends in my life. They have stuck by my side through thick and thin and have always been there for me. Even with all the love my friends and family gave me I still felt like I was on the outside looking in. This feeling has only been exasperated my sever depression and anxiety. Then I started to make Ramen. I remember the first time I made a batch. I watched the broth simmer for 14 hours. I remember watching the broth change from this clear liquid to this substance that looked like a world unto its own. The bubbles of chicken and pork fat that would mix and separate between the surfacing bubbles had me totally enamored. The rhythmic gurgling of the bubbles and the aroma that wafted over me were transformative. I felt at peace. It was as if my depression and anxiety had vanished, like I had taken a magic pill. This feeling would only be matched by the first time I gave some to my best friend Gabby. She looked just like those people sitting at the plastic tables in Ho Chi Minh City eating the Lunch Lady’s soup. The stress of they day appeared. If only for a moment, to disappear. In this moment I felt happy, to see something I made give someone I cared about such joy, just warmed my heart and for a moment nothing could touch me. 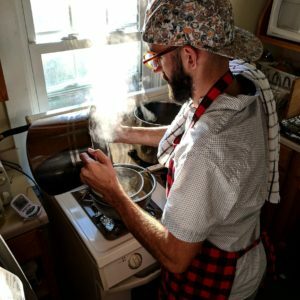 For the last 2 years I have tried to make a batch of ramen every week. It has become to me, the most important thing I can do for my mental health. The act of cooking it brings me peace and tranquility. On my bad days a bowl of it takes away my pain and frustration. Watching my friends and family enjoy it just fills my heart with love. There are so many things we can’t control in life. Things that cause us pain and suffering, sadness and despair. If I can help transport myself or my loved ones, to a place that helps us forget our problems, even if just for a moment, I will do so. Ramen might not solve all my problems or yours, but I know it has saved my life. As silly as it sounds Ramen has saved my life. It has allowed to dive deeper into who I am. For me happiness is at the bottom of a bowl, but it’s a bowl of Ramen.